Wario Land 2 (AKA ワリオランド2 盗まれた財宝 Wario Rando Tsū: Nusumareta Zaihō, “Wario Land 2: The Stolen Treasure” in Japan) is a 2D platformer video game developed and published by Nintendo for the Game Boy handheld console in 1998. It also had a Game Boy Color (GBC) version. This game is the sequel to Super Mario Land 3, which, though named Super Mario Land, was actually about Wario. The story that kicks off the plot is that the antagonists all want to steal all of Wario’s riches. And when the story says steal, what it actually means is that the real owners are just taking back what was stolen from them by Wario in the first installment. Wario Land 2 on the Game Boy Color clearly demonstrates its pedigree as a spinoff of the main Mario franchise. The game shares pretty much the same sort of design philosophy that a gamer would expect from a Mario game. Wario can jump, collect coins, and jump on bad guys to beat them and so much more. What makes Wario Land 2 so unique though is its shift in focus towards puzzles. A player is more likely to get stuck in game progress due to being unable to solve a puzzle rather than dying. In fact, Wario can’t die. That’s right, he’s actually invincible and this plays a very important role in solving puzzles. Wario’s invincibility allows him to endure a great deal of punishment. Being pummeled by a huge weight turns Wario into a pancake that can scurry from side to side like a crab. This form allows him to traverse small spaces which he normally wouldn’t be able to if he were his usual pudgy normal self. It is this sort of gameplay where Wario Land 2 really shines. The level design is excellent because it requires gamers to think differently. In essence, Wario Land 2 doesn’t require precision skills like the typical Mario game does. What the game asks from its players is lateral thinking. It is the ability to look at problems in a new way and find unconventional solutions. Wario Land 2 is an excellent addition to the franchise, which may not be groundbreaking, but shakes things up by forcing players to think more and jump less. 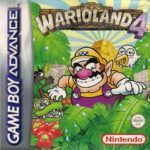 Wario Land 2 has been ported to Game Boy, Game Boy Color (this version), and Nintendo Virtual Console.